Have you ever had the opportunity to taste an assortment of different snacks, candies, other fun items that are from Korea? For most people, the answer is no because it is difficult to even get your hands on such items in the first place. Luckily, SnackFever takes care of that problem for you. 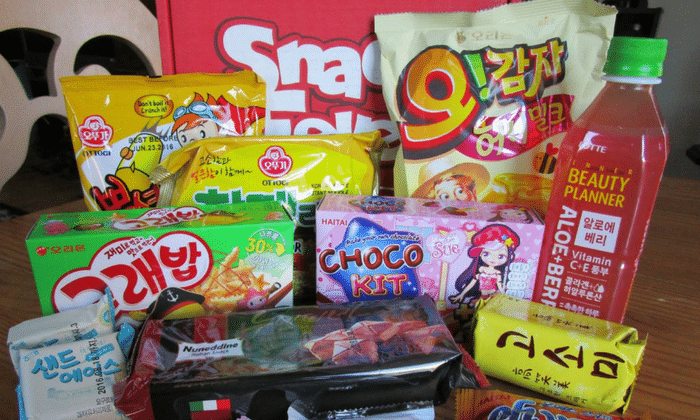 SnackFever is a snack box subscription service that supplies you with Korean snacks and treats. It was founded by David Chung in 2015, is based out of Koreatown, Los Angeles. As of September 2017, SnackFever began shipping from South Korea, which has proved to be much easier and efficient. SnackFever offers several subscription plans, and all you have to do is order choose whichever one works best for you. Simply wait for your snack box to arrive at the doorstep of your home, and you will be enjoying exclusive Korean treats in no time! Continue reading this SnackFever review to find out if this opportunity is truly something that you are interested in. SnackFever is unique in the sense that it provides a great selection of Korean treats. Most people haven't ever experienced Korean food, so it is impressive that SnackFever provides a great variety of Korean Treats. They provide snacks, candies, chocolates, gum, jelly, Korean ramen, and bonus items as well. You have multiple subscription options ranging in different box sizes. The bigger the box you order, the bigger and better the bonus items will get. SnackFever has a featured theme every month, which includes new treats every month as well to match the theme. Because of this, every SnackFever box is a surprise. Every box comes with a sheet listing each item with a description, expiration date, and any other important information. To top it all off, SnackFever ships World-wide for a small fee. Great variety of snacks and other treats that all come from South Korea. You have a great selection subscription plans. They have something that works for almost everyone! SnackFever always includes a sheet inside of their boxes that describes each snack in the box, gives the expiration date, and includes other information that you might need to know. You can order a one-time box that will not renew. SnackFever regularly offers discounts that are available to everyone! SnackFever adds bonus items to your box from time to time! SnackFever has an excellent customer service team that is ready and willing to help you! You are not able to customize your snack box because there is a featured theme every month. All of your snacks/treats will be a surprise. SnackFever does not cater to vegetarians, vegans, etc. They are currently working on bringing a vegetarian option, however. Getting started with SnackFever is very simple! First, you will start off by seeing a button on their home page that reads "Snack Different. Snack Korean." You will also see a button a little bit lower on the home page that says "Get it." Once you choose the box you would like to receive every month, it is now time to choose a monthly plan. You will be asked to choose between the 1 month plan, 3 month prepay plan, 6 month prepay plan, and your 12 month prepay plan. All of the plans listed above automatically renew. You can cancel your subscription at any time, which can easily be done within your account settings. All you have to do is log in to your account, click on "subscriptions", select "edit", and then select "cancel subscription". Be sure to cancel before the next renewal date for your subscription plan. You also have the option to order a one time box that will not automatically renew. While you do not have the luxury of hand picking the items you would like to receive in your box, SnackFever has a featured theme every month that which includes mystery snacks for you to try. This makes it quick and easy. Simply choose the size box you want, how long you want to subscribe for, and wait for it your SnackFever box to arrive to the doorstep of your home! With all three sizes of the boxes that you can subscribe to, you get to decide if you want to pay every month, or prepay for either 3, 6 or 12 months. Following is the pricing breakdown for all three plans. So there you have it. SnackFever has a plan that works for almost everyone. The longer you subscribe for, the more money you will end up saving. SnackFever will ship anywhere, World-wide, for a small fee depending on which box you select. You pay $2.99 for each mini box, $3.99 for each original box, and $5.99 for each deluxe box. Your SnackFever box should arrive somewhere between 7 to 10 days. If you are wondering where your package is while it is being shipped, SnackFever will also provide you with a tracking code. It will be sent directly to your email. You will receive a SnackFever box in a bright red package that should be packed full of goodies! Most people have had great experiences with SnackFever and have many great things to say about it! People seem to love that there are different subscription plans and box sizes. There is plenty of variety and people are able to get exactly what they are looking for. People also seem to really love the treats themselves. It is so hard to find international treats, let alone Korean Treats. SnackFever does the hard work by finding them and shipping them directly to you. They have a great variety and a different theme every month. There were several negative reviews, however. Most negative reviews were people who reflected upon cancellation difficulties. Those people claimed that they cancelled their subscription, yet still got charged. To make sure this does not happen to you, be sure to cancel before the next renewal date for your subscription plan. SnackFever holds up very well against its competitors. There are a handful of snack box subscription services that offer international snacks and treats, but not many offer the extensive variety of treats that SnackFever offers. They provide Koren snacks, candies, chocolates, gum, jelly, ramen, and several fun bonus items for a little something extra. There are 3 different box sizes for you to choose from, as well as 4 different payment plans. For this reason, we believe SnackFever is extremely flexible. They have something that works for almost everybody. Maybe you would like to try SnackFever before committing to a subscription. You can simply order their one-time, non-renewing box. If you like it, you have the choice to pay every month, or prepay for either 3, 6, or 12 months. They make it easy for you! If you are looking to specifically customize a snack box of international treats, however, SnackFever might not be for you. MunchPak, on the other hand, is a subscription box company that offers international treats from all around the world. You will be presented with a box, but you have the option to customize it for a small fee. If MunchPak appeals to you a bit more than SnackFever, click here to check it out! I haven't received a tracking number. You should receive an email with a tracking number. Customers typically receive a tracking number within 1 week after we ship since Korea Post takes time to give us the list. Check your spam/junk folder or your "Promotions" folder if you use Gmail. If you still don't receive your tracking number after 1 week after shipment, send an email to oppas@snackfever.com or use the chat app on their website. The expiration date is confusing. In Korea, everything big comes first. It's year, month, and then day. For example, 1st of October, 2017 would be 17/10/1. Same goes for addresses. It goes country, city, and then the street name. In the rest of the world, it would be street name, city, and then country. Is this from South or North Korea? All products are from South Korea. South Koreans simply say Korea when we refer to South Korea. When anyone, not just South Koreans, says Korea it refers to South Korea. Now that you have read this SnackFever review, you are probably trying to figure out if it is an opportunity that is truly worth-while. SnackFever is great for those of you who are interested in experiencing international snacks and getting a small peek into another culture. SnackFever includes Every a sheet listing each item with a description, expiration date, and other information that you might need to know. If this sounds like something you may be interested in, click here to check it out! SnackFever runs special deals for absolutely anybody rather often. They like to throw in an extra deal from time to time that might save you an extra 10 or 20 percent. Aside from that, you can save money on your SnackFever subscription if you subscribe for longer than a month. You can subscribe for 3 months, 6 months, or 12 months. The longer your subscribe, the more money you save! Last, you will receive a free SnackFever box if you refer up to 3 friends! Sound like a good deal? Click here to get started! SnackFever is a snack box subscription service that supplies you with a great variety of snacks, candies, chocolates, gum, jelly, ramen, and other bonus items. All treats come from South Korea, which makes it a great opportunity for those of you who love trying international treats. They have a plethora of different box sizes and payment plans, which makes it easy for you to get started. Sound like the snack box subscription service that you have been looking for? If so, click here to get started today! Korean treats?! That’s a no brainer. I’ve never had the chance to try treats from Korea! I was pleasantly surprised when I got my box. It was neatly packaged, and everything tasted amazing. I especially thought it was pretty cool to receive Ramen too. I definitely enjoyed recommend SnackFever!